Advice to Anesthetists: Lose anything you like – but NEVER-EVER lose your patient’s airway! Apprentice Doctor Club / Chapter: Module Three: The Airway – it’s all about Oxygen! 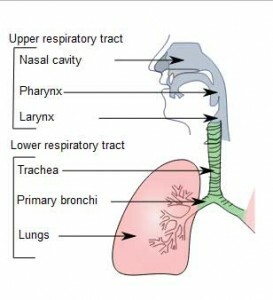 The respiratory system is the bodily system responsible for moving Oxygen from the atmosphere and facilitating the transfer of Oxygen into the bloodstream, as well as moving Carbon Dioxide from the bloodstream into the atmosphere. This might be a bit simplistically stated – as the respiratory system will serve for carrying other useful gasses like anesthetic gasses from the vaporizer in the anesthetic machine to the bloodstream and it will get rid of any other waste gasses e.g. alcohol. Alcohol in the blood (following drinking alcohol-containing beverages) will also evaporate from the bloodstream into the alveoli of the lungs – thus one can smell when someone had too much to drink. Traffic officers use breathalyzers to measure the evaporated alcohol from a driver’s lungs thus getting a very accurate estimate of the blood-alcohol level. The pharynx is shared by two systems of the body – the respiratory system and the digestive system. One breathes air and swallows food – and rarely does it happens that food slips into the larynx! This is due to a set of complex reflexes and an intricate valve structure called the epiglottis. Also consider the unbelievable control it takes by professional singers to control the vocal cords producing the variations of exact frequencies, volume and quality of sound – indeed developing his/her voice into an immensely sophisticated art form! The cardiovascular and the respiratory systems work intimately together to get Oxygen to each and every cell of the human body. One might say that the respiratory system relies on the cardiovascular system to supply it with a constant flow of blood. Without this constant flow, the respiratory system cannot do its work. Let’s look a condition called a lung embolus. Thrombus: A blood clot in a blood vessel or within the heart. Embolus: Something that travels through the bloodstream, lodges in a blood vessel and blocks it. Examples of emboli are a detached blood clot, a clump of bacteria, and foreign material such as air. A lung or pulmonary embolus is a blood clot that has been carried through the blood into the pulmonary artery – the main blood vessel from the heart to the lung – or one of its branches, plugging that vessel. If the Respiratory System intrigues you – you may consider becoming an Anesthetist. One of the main responsibilities of an anesthetist is to ensure that the patient is receiving enough Oxygen during a general anesthetic – and therefore to always ensure an intact airway (guaranteed path of Oxygen flow to the lungs). One of the key skills in ensuring an intact airway is endotracheal intubation (placing an IT tube down the throat of the patient into the trachea – to administer Oxygen and anesthetic gasses to the patient). Registration is Free! It is recommended that Apprentice Doctors start the Future Doctors Course to jump-start their careers!